Eighties for animals” is easy to remember, part of the reason Diane Dieterich, founder of Greener Pastures Farm Sanctuary, chose it as a meme for her organization’s fund-raiser at the Oddfellows Hall in San Luis Obispo. The rest of the reason is simple: “I love the ‘80s,” she said. If you’ve ever felt nostalgic for the 1980s, this was the place to be. Memorabilia was everywhere you looked, from the DeLorean sitting outside the entrance, to the ‘80s music playing inside.There were posters of ‘80s movies — “Ghostbusters,” “Back to the Future” — icons — Cher, Madonna, Tom Petty — and people dressed in ‘80s fashions. A wide-screen TV played clips from television shows like “The Love Boat,” “Family Ties,” and “Married With Children.” But beneath the happy exterior was a deeper purpose — raising money so Greener Pastures can find a permanent home in which to care for abused and abandoned farm animals. While the walls were decorated with ‘80's posters, the tables were packed with everything vegan. There were delicious vegan meatballs, chocolate vegan cookies, vegan cheese, crackers and sausage. “A Guide to Going Vegan” pointed out that for nearly any dish you can think of, there is a vegan alternative, from hamburgers and hot dogs to ice cream, cake and other desserts. The more vegan food we eat, the less the demand for animal food, meaning fewer animals will be slaughtered and fewer will be made to suffer in the often cruel circumstances in which farm animals are kept. Diane soon became aware that Greener Pastures could do more than provide a home for neglected farm animals. Because of the unconditional love the animals offer, they can help in the healing process of abused children, veterans suffering from post traumatic stress disorder, troubled teens, people struggling with addiction, and any other at-risk person that can benefit from the affection and warmth that comes from bonding with animals. Listening to animals is not a problem at Greener Pastures, and the sooner it can find a permanent home the better, for then Diane can get on with her dream of helping animals and humans at the same time. To find out more about Greener Pastures, contact them by calling (805) 543-3786, or email GreenerPasturesSanctuary@gmail.com. Greener Pastures is also on Facebook: www.facebook.com/greenerpasturesfarmsanctuary/. “The greatness of a nation and its moral progress can be judged by the way its animals are treated.” — Mohandas K. Gandhi. Every picture tells a story, and at the Greener Pastures Farm Sanctuary in Arroyo Grande every animal — from Andre the floppy-eared goat to Donna the black hen — has a story to tell. Founder and Executive Director Diane Dieterich knows them all. “Every animal is special,” she said, and her goal is to provide them with a loving home in a safe environment. The animals at Greener Pastures were either abandoned, like Andre, or saved from appalling conditions, like Lemon, a large, multi-colored rooster. “We rescued him from the egg industry,” said Erika Satkoski, who works with Diane. Lemon, who has a prominent blue-black tail and a large red comb on his head, crows in agreement. Lemon and the other roosters and hens at Greener Pastures are fortunate. Chickens in the egg industry are subjected to especially cruel conditions. Crammed into spaces so small they can't even stretch their wings, their feet cut by the hard wire of their cages, they are slaughtered, often by gas, when their egg-laying production declines, many years before the end of their natural life cycle. But the treatment of chickens is only one of many examples of the mistreatment of farm animals that groups like Greener Pastures want to save them from. Many cows live in cramped, manure-laden pens and have to lie in their own feces. Many male calves are taken from their mothers at 2 days old, then chained in crates and killed for veal at four months. Female pigs are kept in breeding cages, some so small they cannot turn around, and frequently suffer from abrasions on their heads from trying to escape. The list, sadly, goes on and on. But the goals of Diane and Erika do not stop at simply rescuing farm animals and rehabilitating them from the trauma they have suffered. They see an even greater purpose — making these animals available to at-risk children and helping them heal from emotional and or physical abuse by bonding with the animals at Greener Pastures. There they can discover that interacting with these animals can begin the healing process, sharing the love animals have to offer. Greener Pastures is searching for a permanent location in San Luis Obispo County where this work can be carried on. “We need five to 10 acres of flat land, preferably fenced, with a barn and living quarters,” Diane said. That would enable them to help more animals and reach out to the community. Diane would like to have an extended youth program, and offer internships and workshops on how to be gentle with animals. She wants to emphasize educating children about animals, especially farm animals, and learn about the unconditional love animals have to offer. While the focus is on children, others can benefit. Veterans and others with PTSD, handicapped or special-needs children, troubled teens, addicts and anyone else at risk can benefit from bonding with farm animals. “Until one has loved an animal, a part of one’s soul remains unawakened,” Anatole France observed. The love for animals, and for humans too, can be felt on every inch of Greener Pastures. Along with seeking a new location, Greener Pastures will be putting on an ‘80s-themed fund-raiser on Sept. 22, at Oddfellows Hall in San Luis Obispo. For more information, contact Greener Pastures Farm Sanctuary, P.O. Box 13513, San Luis Obispo, CA, 93406. You can also call 543-3786, or email GreenerPasturesSanctuary@gmail.com. Greener Pastures is also on Facebook. www.facebook.com/greenerpasturesfarmsanctuary/. Mark James Miller is an associate English instructor at Allan Hancock College and president of the Part-Time Faculty Association. He can be reached at mark@pfaofahc.com. ​ANIMAL FARM Greener Pastures Sanctuary rescues farm animals and shares them with children and other groups for education and therapy. When Pioneer Valley High School student Leslie Torres realized the lamb she had raised for the Future Farmers of America program would be auctioned off and slaughtered, she knew she couldn't let that happen. Torres had helped raise and take care of Lily the lamb, growing closer and fostering a relationship with her. So when Torres needed help rescuing Lily, friends of Greener Pastures stepped in to help. Lily would have a permanent place to stay, and Torres could visit whenever she wanted. Because of animals like Lily, Diane Dieterich founded Greener Pastures Sanctuary to rescue abused, neglected, and unwanted farm animals. From abandoned goats to hens that were scheduled to be killed, the nonprofit organization offers a place of safety for farm animals and a place of education and therapy for children. "We've been really removed from farm animals because of the growth of factory farming and reduction of family farming," she said. "Because of this distancing, we reserve our compassion for animals that are allowed in our homes like dogs and cats, but there's nothing for farm animals." Dieterich was inspired to start Greener Pastures Sanctuary after visiting a farm sanctuary in Southern California, because she realized nothing like that exists in SLO despite its background in agriculture. She and other Greener Pastures Sanctuary board members help rescue the animals. However, due to the fact that there isn't a central location for the sanctuary, each board member hosts a couple of the rescued animals at their residences in neighborhoods or rural areas. Currently, the sanctuary offers group tours, education, public tours, extended youth program, special needs programs, internships, volunteer opportunities, and workshops. Children from troubled or abusive backgrounds are invited to visit the sanctuary and learn how to handle, brush, and be gentle with the animals. "It's astonishing how a really hardened tough kid who's had a lot of abuse or neglect kind of comes out of their shell when they're with an animal," Dieterich said. "It evokes something inside of them so they can feel empathy for a living thing, and they end up becoming a protector instead of a bully." Dieterich acknowledges that although visitors can opt to just visit a petting zoo, there is a much greater impact from visiting an animal sanctuary. She said the children grow and change after hearing how an animal triumphed and overcame their obstacles. "We share with the children the history of each of the animals, their resilience and why it's important to show compassion for animals," she said. "They learn that even though we all look different on the outside, we're all really the same on the inside." 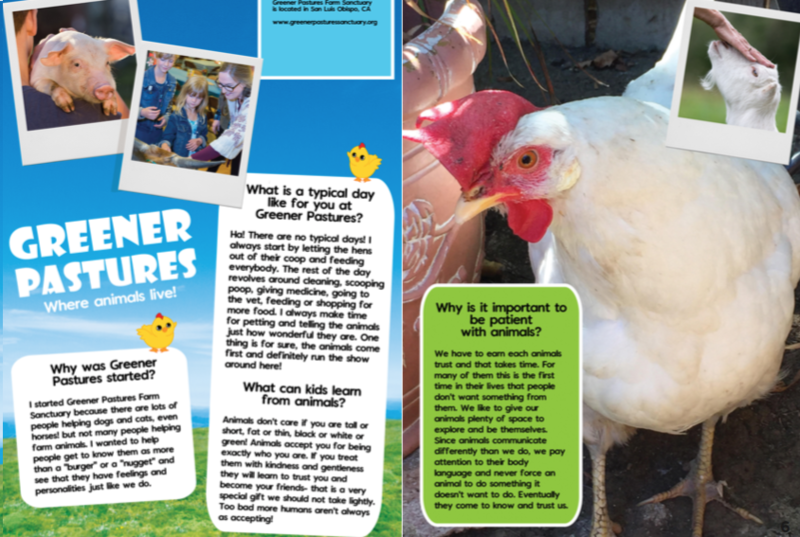 In addition, retired teachers create lesson plans centered on the animals themselves. Children are taught about where the animals came from, how they were rescued, and specific questions such as why goats chew, why roosters crow, and why pigs love mud. While the program focuses on children of all ages, groups like Transitions Mental Health, Options Family of Services, and Hearst Cancer Center are also invited to visit the sanctuary. Dieterich hopes to open an at-risk youth program for children to come spend a full day helping and learning about the animals, in addition to an internship program. Greener Pastures Sanctuary is currently seeking land to lease and monetary donations, since all expenses for the program are paid out of pocket. In the future, the program aims to take on more animals and increase access for the general public.